Where should you stay on your Portland steelhead fishing trip? Near the river, of course! Portland, Oregon has all the chain hotels, luxury hotels, and budget motels you could want. For those looking for a change of pace, however, take a look at one of these four options. The first two listings are riverfront bed & breakfast offerings on the Sandy River, a major Portland steelhead fishing trip destination. 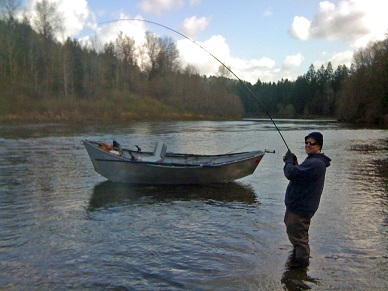 Steelhead fishing in Oregon became popular in the late nineteenth century and early 20th century. East coast transplants brought with them the east coast fly fishing techniques of the day and eventually adapted them to the bigger and stronger “great western rivers” of California, Oregon and elsewhere in the Pacific Northwest. So you want to go steelhead fishing in Oregon but you want to make sure you pick the right steelhead fishing guide. What are some of the questions you should ask before deciding? First off let’s start with a basic breakdown of Oregon steelhead fishing guides. For all intensive purposes, Oregon steelhead fishing guides can be classified into three categories. A steelhead trout (Oncorhynchus mykiss) is genetically identical to a rainbow trout. The difference between the two is that a rainbow trout spends its entire life cycle in freshwater while a steelhead trout is anadromous (sea-run) and migrates to the ocean to feed for a portion of its life cycle. Adult steelhead generally return to the freshwater stream where they were born after spending 2-3 years in the ocean to feed.